Cantonese food with Spanish flavors enjoyed by Filipinos in a restaurant with American country interiors—sounds confusing? Comida China de Manila isn’t at all confusing. Its recipes, after all, have been around since the early 1900s. Comida China de Manila along C-5 in Pasig serves “prewar Chinese food as it was served in Binondo,” or, as president Benny Torres calls it, “mestizong Intsik” cuisine. He explains how it has evolved from a humble panciteria in Binondo to a full-service 400-seat restaurant in Pasig. Chinese settlers in Old Manila made panciterias pretty popular in the 1900s. His grandfather, Renato T. Torres, opened one; he was born to a Chinese grandmother and a Spanish grandfather. He married Belen, a Filipino. Renato opened the panciteria at the end of the Spanish regime. Serving what would be considered now as Chinese comfort food, it grew into a restaurant, and Panciteria San Jacinto was opened in 1996 in Pasig. The dining area is designed like a typical Chinese restaurant. The five function rooms are decked differently—they have a wood country cabin theme. Meal starter is the Comida China Soup, a rich savory soup with eggs, pork, green peas and carrots. Pinsec Frito, a popper of an appetizer, is a plate of deep-fried wanton triangles filled with minced pork or shrimp balls—a favorite among kids. 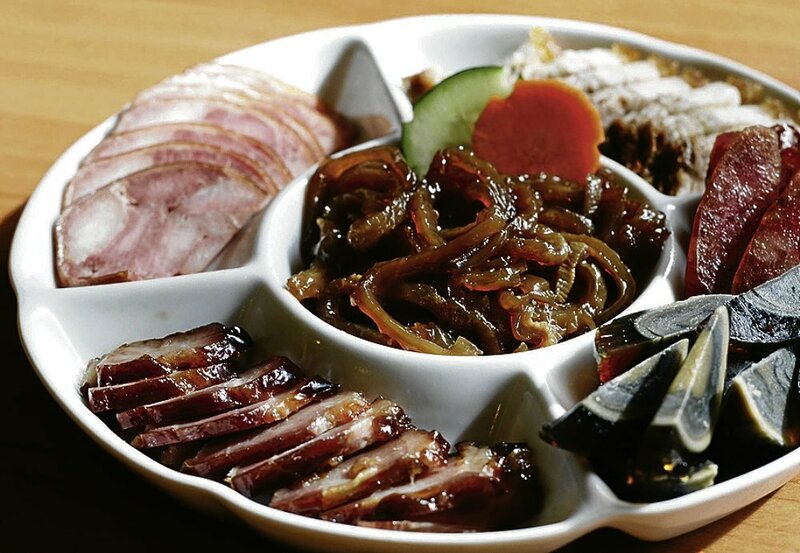 The Cold Cuts Platter has slices of roast pork barbecue, lechon Macau, Chinese sausage, pata jamon, seaweed and slices of century egg. Camaron is fried brown bun—chunky, flavorful shrimp meat coated in bread crumbs, wrapped in Chinese ham, then deep-fried. The slightly sweet shrimp goes well with the salty ham, and the batter gives it a good crunch. The dip is sweet and spicy. Fried Shrimp Balls are minced shrimps coated in bread crumbs, then deep fried until golden brown. Those who prefer non-meat fare may have the Beancurd with Fish—fresh, silky tofu and battered fish fillet with sweet-salty sauce, a saute of garlic, tomatoes and yellow beans; or the Fried Lapu-Lapu with Sweet and Sour Sauce. Of course, these entrees go best with Chinese fried rice. Among the choices are the Fried Rice with Roasted Barbecued Pork and Chinese Sausage; Yang Chow with pork barbecue, shrimp, green peas and onions; Fried Rice with Asado and Chinese Sausage; fried rice with shrimp, crab meat or salted fish and diced chicken. For noodles, there are the Comida China Chow Mein, a combination of Chinese broccoli leaves, black mushroom, pork, shrimps and canton noodles; Old Rickshaw Fried Noodles; Long Life Pancit Canton. What sets Comida China apart from other Chinese restaurants? Torres banks on the fare’s novelty. Its new name, logo and interiors inspired by “vintage Manila,” Comida China hopes to become a “mestizong Intsik” food crossover to today’s generation. Visit Comida China de Manila at FRFC Bldg., 106 E. Rodriguez Ave., Ugong, Pasig. Call 6715942, 9140832 and 9140830; visit Comida China de Manila on Facebook. Dredge the fish fillet in flour and dip in beaten egg, salt and pepper mixture. Deep-fry until golden brown and set aside. In a wok, heat cooking oil. Briefly sauté garlic, then add the ginger, green pepper and black beans. Add the soy sauce, oyster sauce, sugar and stock, and let it boil. Thicken the sauce with the cornstarch dissolved in water. Add the fried fish fillet to the sauce and let it boil. Remove from heat and pour contents into a serving platter. Good for two to three persons. Next Seafood and meat ‘paella’–the largest in Manila!